Nairobi Diaries costars Noti Flow and Mustafa like each other but there is only one problem: the rapper has a wife. This is according to Noti Flow who confessed to Nation.co.ke that she would have given the ‘Loboko’ rapper a chance if he wasn’t married. 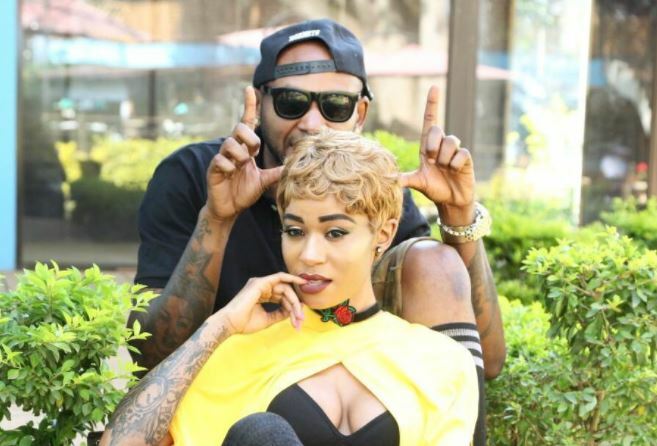 The female rapper also opened up about her realtionship with Prezzo and the drama surrounding a music video shoot for her single ‘Tupendane.’ She also revealed if she is bisexual. What’s with the American accent? People are asking if it is it fake or real? Aaah! This is how I talk and I don’t care what people say. I can’t try to sound like someone else. Every time I open my mouth to talk, that’s how it comes out. And I don’t get it : why would my accent be a problem if they understand what I’m saying? Have you ever lived in the US, where most people think you trying to copy the accent from? Yeah! And as a matter of fact I studied high school there. But above all its shouldn’t be a problem that’s bull**t, watu wafikirie vitu za muhimu kama muziki. On the Nairobi Diaries, are you guys real or you just faking and stage-managing the scandals? Hahaha! But of course it’s real, it’s a reality show unless other people in the cast are faking it, I don’t know because for me, I am real in everything that I do. How was the experience when you joined the show? I joined in Season 3 (Season 6 just conclude a couple weeks ago), and got bullied a lot but right now I am the bully. You just dropped a new video “Kamatia” how is it doing? It’s doing great, inafanya poa sana. It’s been trending the whole time and right now it’s already hit 100k views yet it’s just a week old. Despite it being a political season, people still clicked on it so it was a gamble that paid off. Initially your plans was to release a different song ‘Tupendane’ that you collaborated with Prezzo, but you later claimed he stood you up on the day of shooting and that’s why you choose to do “Kamatia” instead? Yeah, he started acting and bringing so much trouble on the night to the day of shooting giving all sort of stupid excuses and I didn’t want more stress than I already had as far as shooting the video was concerned. So I decided to do “Kamatia” instead. I wouldn’t mind because I believe in second chances. Initially I had given up in releasing the peace song because we had already elected the president and I wanted it to go with the current political mood. But here we are again there is another chance to do the right thing. If he is willing, I will put my ego down and pay again for the video for the sake of my career. Do you think Prezzo stood you up because of your closeness to Colonel Moustafa of late? Isn’t that obvious. Before that Moustafa and I weren’t close and I guess that’s why he was comfortable with the whole process of us working together at the beginning. On noticing how close I was to Mous, he confronted me and I told him the truth and maybe that why he started acting like he did. Are you and Moustafa an item? I like Moustafa, he is a good guy and I know he likes me too but the problem is, he has a wife. If he didn’t have a wife, I would have given him a chance. I’m not a home wrecker. Have you met his wife? No, I don’t even know how he looks like. I hear it’s an unhappy union. Are you straight? Rumour has it that you swing both ways. I that’s kind of true. I love girls and whenever I am hurt by men that can never be trusted, I turn to them.